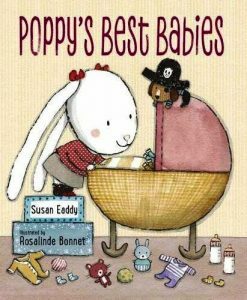 Author Susan Eaddy’s newest picture book, Poppy’s Best Babies, is the perfect gift for young children who are welcoming a new sibling into the family. 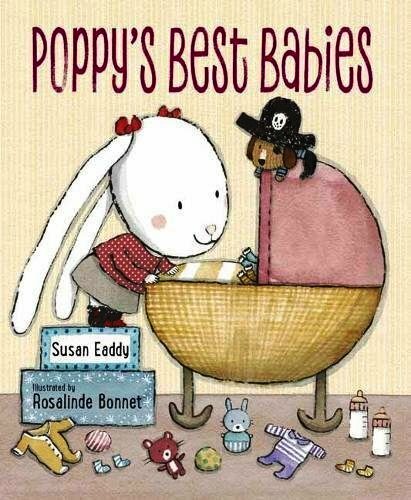 In the book, cuddly, long-eared little Poppy is happy that her twin sisters are born. She’s also happy that Gee Gee (her hip grandmother) will stay with the family for the next two weeks to help out with the babies. What she’s not happy about is the fact that those tiny babies gobble up BIG chunks of everyone’s time and attention — especially Gee Gee’s. Like any respectable older sibling, Poppy has her pride and pretends it doesn’t bother her that Gee Gee isn’t around to help her do the fun things they used to do. 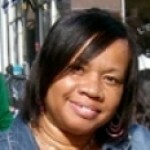 But the pretense only goes so far, and the more unavailable Gee Gee becomes, the more frustrated Poppy becomes. She finally has to “do a little thinking” to figure out how to make room for the babies and share time with Gee Gee in the process. This is a sweet and timely little book that expertly captures the pride, annoyance, concern, and even jealousy, that comes along with moving aside for a new addition to the family. The prose is fast-paced and funny, and should keep young readers who suddenly find themselves in a similar predicament turning the pages until the very end. Artist Rosalinde Bonnet’s illustrations are full of color and capture the happy chaos of the early elementary years, including cluttered bedrooms, messy kitchens, and furry frowns on Poppy’s face as she displays her displeasure at the feeling of being “replaced” by her new baby sisters. Perfect for the “only child” who is about to become a big brother/big sister whether he or she is ready or not. It can also be used to open a classroom discussion about emotions like the frustration, jealousy and concern that come along with making room for others.